The ROCKET RACK System was designed and patented by Ron Meyer, an IBEW Local One electrician working mainly in the food-processing industry. He was frustrated with the expensive and dangerous process of on-site rack fabrication. all-thread rod with FDA-Certified PVC Coating was also part of the original lineup. Along the way a new product was designed – ROCKET RACK TentedTM, with slot and mounting holes cut into the peak of the angle – resulting in a total of five patents. The ROCKET RACK System provides a smooth, sanitary way to install conduit or process pipe. Its patented slot design eliminates harborage points because there are no recessed spaces or exposed threads. Using ROCKET RACK results in perfectly-aligned pipe runs, which makes for a beautiful, clean and sleek installation. Its smooth, clean lines and buffed finish – along with radius corners – make it beautiful and elegant too, perfect for high-end residential or commercial installations featuring an open ceiling design. ROCKET RACK is infinitely reusable, as pipe and conduit can be placed anywhere along the slot. When re-tooling or re-configuring a plant layout, existing ROCKET RACK racks can be disassembled and re-installed again and again, making it a sustainable component of your installation. And, of course, the safety aspects of a prefabricated system are immeasurable to the contractor. ROCKET RACK saves time and money and meets all standards set forth in the 2016 Food Safety Modernization Act. 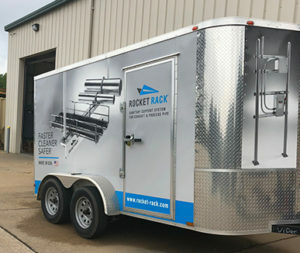 ROCKET RACK continues to develop new and innovative products, always striving to make the contractor’s job easier, with faster and safer installations. Our design team is happy to come up with a unique and sanitary mounting solution for your next food-grade project. Just let us know what type of conduit or process piping you‘ll be installing or the dimensions of equipment you need to mount. We’ll be happy to design a ROCKET RACK solution for you!